“Why do you work in Maine when you live in Oregon?” is a question I get fairly often. Between coworkers asking if I’m from somewhere on the East Coast, or if I have family there, or if my mom thinks I’m going to end up moving there, Maine comes up a lot. I found Runoia when I was looking for a “traditional” camp. The year before I had spent my summer at a day camp with British military kiddos in Germany, and the year before that I had worked at another day camp with kids from the American military in South Korea. After spending a few years in unorthodox camps, I was looking to stay in the US in 2017 (granted Maine is the farthest away from Oregon I could have been). I had a few ideas of what I was looking for. 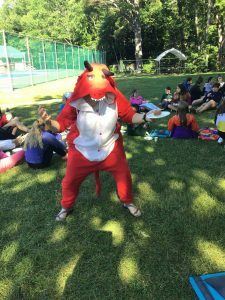 I wanted a sleepaway camp, I wanted something that worked with my summer break dates since I was still in college, and I wanted a camp that had been open more than 50 years. but were still very present at camp. This was the most important factor to me, since other camps I’ve worked at were relatively new or were still figuring out their own identities. 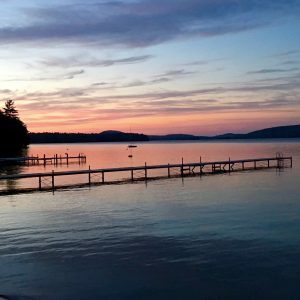 I essentially became a first-time camper myself as I combed through the internet, squirreling out all the information about a camp that I could find. After the longest weekend ever, I was down from 280 camps across the eastern United States to three that all seemed like good fits. I applied to all three, Runoia being the first one to respond back. I was on the phone with Alex in under 12 hours of applying, and that is not an exaggeration. The second camp and I had a Skype interview, but when I told them I didn’t have a driver’s license they told me I didn’t have a job with them. The third camp and I played phone tag for three days until I gave up on them. This wasn’t necessarily a bad thing, Runoia sounded great from the phone interview and everything I found online, so the fates had made the decision for me. And Runoia was great! Driving up to the camp for the first time was just wonderful, and the amount of information and history that I got on day one was more than enough to make sure that I chose the right camp. 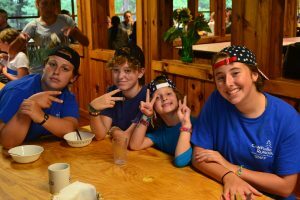 There were similar elements from other camps that I’ve loved in the past, too, like family style dining, field trips offsite, singing songs, and Runoia seemed like a place I could really invest in. I can’t tell you what specifically got me “hooked” on Runoia. If it was the towering trees or the time by Great Pond, or the expectation that if this is what I could do in my first year, what could I do next year? I was sad, to say the least, when we started to pack camp up. How could it be over already? if I was going back to Runoia in 2018 and my mom basically laughed at me and said, in my sad state, that I had already made my decision. In addition to building my own life long skills in basket weaving at Runoia, I continue to work with girls who, I think, really just need their own space and time to find themselves! I know I needed that when I was younger, and I’m glad that I can be someone that kiddos can look up to. Oh no, now I’m campsick again.